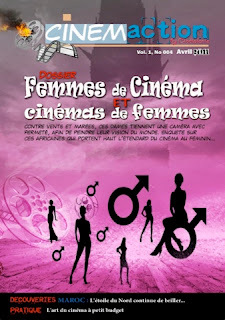 CinémAction, the French-language online magazine devoted to African cinema dedicates its April 2011 edition to African women. Under the title “Femmes de Cinéma et Cinémas de Femmes” (Women of Cinema and Cinemas of Women) this issue features diverse themes with a focus on women. The French to English translation of the editorial below gives the English-language reader a preview of the content. Time and time again at the end of conferences and meetings, there is the same regret: that women are more or less relegated to the background in most areas of decision making in the public sphere. And cinema, unfortunately is no exception. Because, as Penda Mbow states, “after more than a hundred years of world cinema, fifty years of African cinema, and thirty years of television in Africa, African women certainly like to be seen in films (...) but their absence behind the camera stands out even more.” Yet they lack neither potential nor creativity. Certain prejudices are the main obstacles to the development of their talents. But times are changing. The success of the film Paris à tout prix (Paris at any cost) by Cameroonian Joséphine Ndagnou or the awards received by Moroccan Zakia Tahiri for her film Number One, proves this. The creation of Journées cinématographiques de la femme africaine de l’image (JCFA), a biannual Burkina Faso-based event showcasing African women in film, in 2010, and the enormous success by women at the last FESPACO reinforce the optimism that African women in cinema are becoming increasingly visible. As seen by the quality of this dossier, we continue to celebrate women. In honor of the Maghrebian filmmaker Zakia Tahiri we take you to North Africa. With Eliane Gubin we look at her book, “A century of feminisms”. We also talk with Narcisse Wandji, founder of the International Festival of Women (Mis Me Binga). In addition, if you are wondering how to make a film with limited funds, you may find the response under the category “Pratique”. Also the website of the month, www.universal-soundbank.com/ and the logithèque (software and program corner) will assist you in this regard. Is [CinémAction] worth returning to each month? Please let us know. Perhaps next month the readership will be even more numerous. 3. Indices: Le cinema africain peut-il se féminiser?